NASA has granted an extension of the GRAIL moon mission until December, allowing scientists to complete a more definitive map of the lunar gravity field from a lower orbit, according to agency officials and researchers. The $496 million mission was due to end in June. The extension was confirmed by Jim Green, head of NASA's planetary science division, and Maria Zuber, the GRAIL mission's principal investigator from the Massachusetts Institute of Technology. The twin GRAIL satellites entered orbit around the moon Dec. 31 and Jan. 1, then began taking science observations in early March. GRAIL's baseline mission was supposed to last about three months. Flying in formation at an average altitude of 34 miles above the moon's surface, the two GRAIL spacecraft will shift their relative range from as close as 40 miles and as far as 140 miles apart, according to NASA. GRAIL stands for Gravity Recovery and Interior Laboratory. Its two satellites are nicknamed Ebb and Flow. Researchers use radio signals between the satellites to calculate the distance between the spacecraft, which will gradually change as they fly over regions of the moon with stronger and weaker gravity. The moon's bumpy gravity field is caused by mountains, lava flows, craters and underground masses beneath the lunar surface. Scientists say a precise gravity model of the moon will reveal its internal structure, composition and the size of a potential solid core. The mission's scheduled end in June was timed before a solar eclipse, which would deny sunlight from each satellite's solar panels to charge batteries. "Our initial analysis on eclipse survival was based on prudent and appropriately conservative assumptions," Zuber said in an email to Spaceflight Now. "Fortunately, both spacecraft are performing much better than those assumptions." NASA officials said GRAIL should survive the June solar eclipse and continue functioning for a second three-month mapping cycle, which is expected to begin in September. The average altitude of the satellites during the second mapping phase will be about 14 miles, but the spacecraft will pass as low as 4.3 miles, according to Zuber. The GRAIL satellites, each about the size of a washing machine, would experience another eclipse in December, and analysis shows the craft would survive again. "We made the decision to use our remaining fuel to fly as low an orbit as we could be sure to safely maintain because this scenario has the highest science value," Zuber said. 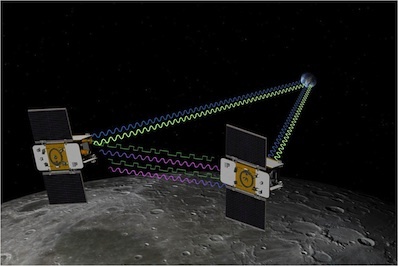 The moon's uneven gravity field presents a challenge to ground controllers planning trajectories for low-altitude lunar orbiters. The tug of lunar gravity can alter a satellite's orbit, requiring frequent rocket burns to adjust the spacecraft's path around the moon. Gravity measurements from closer to the lunar surface should yield more precise data on its strength around the moon, giving scientists more insight into the lunar interior, Green said. The GRAIL satellites will be crashed into the moon at the end of the mission. Mission planners are formulating ideas for the impact scenario, evaluating the possibility of aiming the crashes so they are within the field-of-view of instruments on NASA's Lunar Reconnaissance Orbiter.